language. 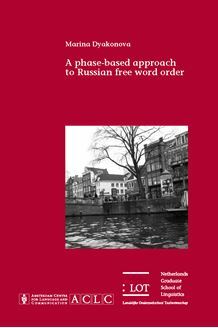 The book comprises a thorough description of the Russian data, an overview of previous research on the subject, a new syntactic analysis, and an extension of the proposed approach to other languages. Structure is encoded directly in narrow syntax via [Topic] and [Focus] features. These features are checked by feature-matching with the dedicated functional heads, Topo and Foco, which form part of the phasal Edge, a structural domain relevant for discourse-related information encoding. The main premise of the present study is that the Edge is an integral part of the architecture of both phases, vP and CP. Thus [Topic] and [Focus] features can be checked at the level of vP as well as at the level of CP. The conclusion reached in the study is that all languages use the vP- and the CP-phase Edges for Information Structure encoding. Crosslinguistic variation stems from the extent to which the Edges are activated as well as from some IS-independent language-specific grammatical properties. The book will be of interest to researchers working on syntax, the relation between syntax and pragmatics as well as for those interested in crosslinguistic instantiation of Information Structure.